The aluminum Ford F-150 SuperCrew received a five-star overall crash safety from the NHTSA — one star higher than the 2014 model made of steel, Ford announced Thursday. The regular-cab F-150 had not yet been evaluated by the National Highway Traffic Safety Administration. The board of the Insurance Institute of Highway Safety, which also releases high-profile crash-test ratings, was expected to also get a preview of that organization’s findings today, IIHS tweeted. That might have been the last F-150 hurdle for Ford to overcome in terms of selling the truck to a mainstream audience. Some research indicates that individual safety features might resonate more with customers than the overall safety rating, so it might be moot. But it definitely matters to an insurer setting rates, and what insurers will conclude once they get a year of data is the million-dollar-question. Plus, it still gives a car salesman ammunition to convince a customer who thinks of aluminum as the flimsy metal in Coke cans and aluminum foil. The F-150 received five stars in every crash test conducted by the NHTSA except in rollovers, in which it received four. The more high-strength-steel-intensive Chevrolet Silverado 1500 and GMC Sierra 1500 received the same reviews — so the steel industry isn’t out for the count by any means. No other 2015 model year truck has received an overall five-star rating yet this year, but the NHTSA doesn’t appear to be done rating them yet. In any case, the engineering that Ford said made the F-150 safer in a crash is of interest to collision repairers who will fix it afterward. Those metals’ ability to protect passengers were considered by Ford engineers and in its simulations. 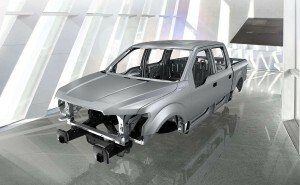 The truck has an extra crossmember and a “patented 12-corner front crush horn” that dissapates more frontal-crash energy and ensures the “frame buckles predictably to keep those forces away from occupants in the cabin,” according to Ford. The aluminum cab has hydroformed roof rails (the rails were shaped by liquid pressure instead of stamping or welding) creating a cage around the doors and extruded rocker rails and roof bows. And also of note: Glue made a safer truck than welds, Ford says.